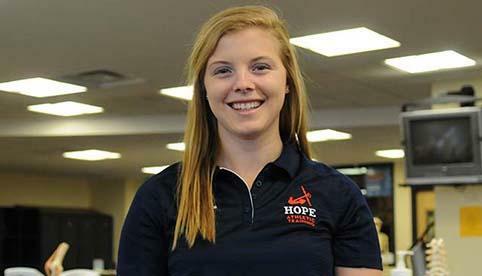 Hope College’s Cara Conrad has become the third recipient of a NCAA Women’s Enhancement Program Postgraduate Scholarship in school history. The senior from St. Joseph, Mich. (Michigan Lutheran HS), will receive a one-time, $7,500 nonrenewable award to use during the 2014-15 academic year. Conrad, an athletic training student, also will be given an all-expenses paid trip to the NCAA Career in Sports Forum on June 5-8 at the NCAA national office in Indianapolis, Ind. Conrad plans to use the NCAA grant toward graduate school for physical therapy. Conrad joins former Hope athletic training students Kelsey Guisbert and Emily Schlitz as NCAA Women’s Enhancement Program Postgraduate Scholarship recipients. Guisbert and Schlitz both were honored in 2006. Conrad is the third Hope student to receive an NCAA grant this school year. Football player Michael Atwell and cross country runner Sheri McCormack were awarded NCAA Postgraduate Scholarships earlier this month. “It’s encouraging that my hard work has paid off,” Conrad said. Conrad intends to become an athletic trainer for a NCAA Division I gymnastics team, reflecting her lifelong passion for the sport. Conrad said that her time at Hope and the instruction here helped her be in position to be heading to graduate school and receive an NCAA grant. Brumels said that Conrad is an extremely good student who is able to comprehend and apply the information that has been given to her in a meaningful way. “She performs admirably in the classroom and has the ability to translate her didactic knowledge into the clinical setting during real patient care situations. I am impressed by the fact that Cara will ask questions until the information presented to her is clear and understood in its entirety,” he said. “Cara is in the latter stages of her academic development, and has been very organized and thorough with her academic studies and possesses many character traits that should serve her well in health care profession employment. She is prompt, dedicated, friendly, and personable. “I have seen Cara become more and more comfortable during her clinical experiences in the athletic training room. I am excited for what the future holds for Cara as she progresses through graduate school,” Brumels said. Hope College midfielder Molly Greenfield is the Michigan Intercollegiate Athletic Association Women’s Lacrosse Offensive Player of the Week for games played through March 30. A total of three Hope College juniors have received recognition through the highly competitive scholarship program of the Barry M. Goldwater Scholarship and Excellence in Education Foundation. Original research by Hope College students will be highlighted today (Friday) during the annual Celebration of Undergraduate Research and Creative Performance from 2:30 to 5: 30 p.m. at the Richard and Helen DeVos Fieldhouse.